GO-Club FB Group | Join other individuals for group adventure! One of the best things about adventure sports is that no matter how old you are, or how much experience you have, it is relatively easy to go out and try a new adventure activity. And, like most experiences, adventures are better (and safer) when done with friends. But what happens when you can’t find someone to share the adventure with? Joining a GO Club outing with GO-Adventures gives you expert instruction, and some new friends to try it with! We’ll pair individuals together into a single group, and once we have enough people to meet the 4 or 6 participant minimum (depending on the trip), the adventure is on! Like Us on Facebook and you’ll be automatically entered to win a free GO Club Adventure! Drawings held each month, so you have 12 chances a year to WIN!! Caving (sometimes referred to as spelunking) combines a variety of activities — hiking, rock scrambling, free climbing, exploration, geology, conservation, advanced rope climbing, and even wading and swimming — into a single unique underground adventure! Caves have formed in every region of the world, and the mid-atlantic region is home to more than 2000 explored caves. The caves in this region can be 500+ million years old, and are formed by the continuous growth of structures in ancient limestone that is generally older than the Appalachians themselves! Caving participants may see beautiful cave formations, fossils, bats, and more. And with caves maintaining a constant average of 55 degrees F year-round, caving becomes the perfect winter adventure! This cave is located in the West Virginia panhandle on the WV-MD border, about 1.5 hrs from DC. There are two entrances to the cave, lots of small side passages, nice formations, and has a 40+ foot drop about 2/3 of the way in that requires ropes to get down (this second part of the cave is the intermediate trip, since it has the rappel, some crawling sections, then climbing back up the rappel). There is one small beginner level cave right next to it that we can also visit if time permits. Price is $125 per person. This Pennsylvania caving adventure starts out with a tunnel that goes under Interstate 81, and opens up into a wet and muddy cave with some great passages for adventurous exploration. 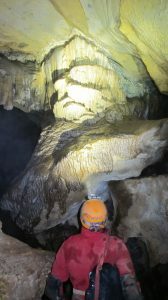 For those who have completed the Introduction to Caving in WV, and want another short day trip, Pennsylvania caving provides a good challenge for beginners, without too much climbing. About 2 hours from DC. Have you been bitten by the caving bug? Ready to push yourself a little deeper into adventure caving? 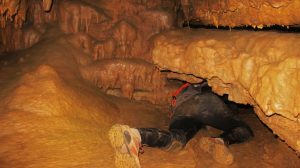 If you are willing to drive a little farther from the DC area, you can find a longer or deeper caving experience – or both! We can train you for rappelling and ascending in an underground environment – which is quite different from above ground – and provide the necessary equipment for such an experience. 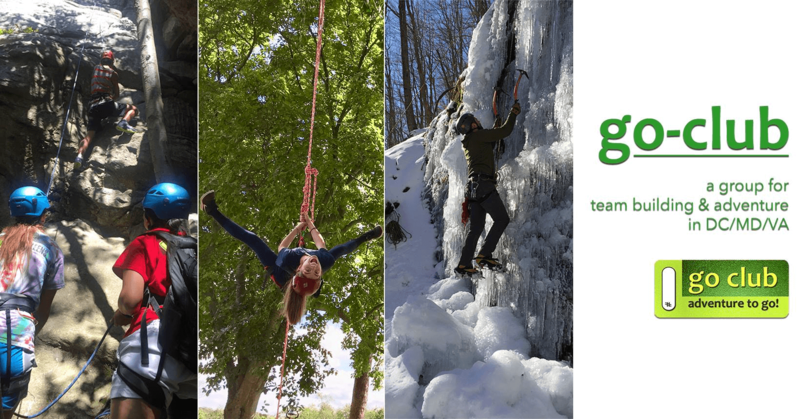 Whether you are new to the sport, or are looking for a course to get you to the next level, GO-Adventures has a rock climbing program for you! This 4 to 6 hour program will give you the skills you need for both indoor gym climbing and guided outdoor top-rope climbing. Join us in Franklin, WV for a crash course in Sport Climbing, before you head out to one of the close sport climbing destination such as New River Gorge, WV or Red River, KY. This clinic is a must for anyone venturing into a wilderness climbing adventure! How would you survive a night outdoors? Do you have the necessary skills to keep warm, dry and hydrated? This course will start you on your journey toward self-sufficiency in a wilderness survival situation. Recreational Tree Climbing is one of the best ways to adventure without having to go too far from home – trees are easy to find in your own back yard! In this 6-8 hour course you will learn the basics of climbing safely into the canopy. Once you have mastered these basic skills, join us for a weekend ‘tree-versing’ adventure – we’ll traverse between 6 trees in Seneca Creek State Park, spending the night swinging from the branches in a hammock!